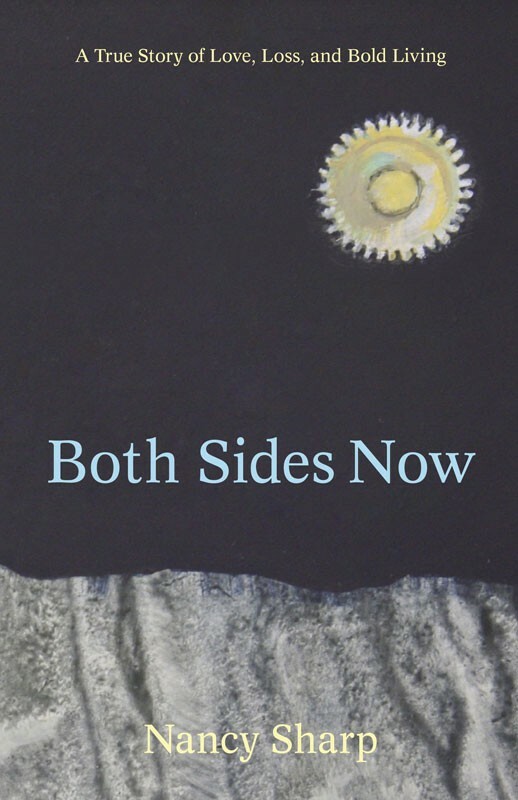 Both Sides Now explores the journey toward healing that Sharp began after her first husband Brett’s death from cancer in his late thirties. Nancy was left to raise two-year-old twins, born prematurely on the very day they learned that Brett’s cancer, which had been in remission, had returned. After his death, Nancy moved to Denver, Colorado, where she met and married Stephen Saunders, a widower with two sons. Nancy is now a speaker and writer. Her twins are currently thirteen and the older boys are twenty-two and twenty-three. Tara: When your status shifted from being married to being a widow, you became a Solo Mom. Did you feel a shift in your community? In other words, did you feel as though you still belonged in the community you had known? Did you feel understood? Nancy: After Brett died things felt very different. Regarding “community,” I felt “other”—not isolated, but different. The feelings of who I am—I don’t think I felt them right away. I was searching for community. I had people who were there for me consistently. At the same time, something had shifted in me. I was thinking a lot about the concept of “otherness.” This was the thing of dissociation—where everything felt surreal. It was like walking on a movie set you did not really belong on. Brett and I got to say goodbye—and this was a gift—but nothing prepares you for the black hole after he died. Certainly I was searching for community and a spiritual connection as I tried to feel understood again. Tara: How did you navigate finding a new community of Solo Moms? What practical problems did you find especially difficult in those early days? Nancy: I guess when I think about this, there was so much “at once” in my story. I was in survival mode—with the twins and Brett’s death at the same time. I did not realize how truly exhausting grief was, and I was exhausted all the time. It would have been helpful to feel permitted to rest every day. I felt guilty that the physiological effects of grief would carry over into everything. There is now a lot more of an online community than that which existed at the time of Brett’s death. Things that were pressing to me were things like child care. What I think I would have found helpful, had this existed at the time, would be the ability to meet others in my situation online. Then it would have been possible to connect with others while not having to leave home. Tara: Given that you were simultaneously tasked with raising twins who had been born prematurely and caring for a terminally ill husband, I can only imagine how your sense of time, urgency, and priorities were shaped. Can you speak to this? Nancy: Everything was about the now. I was living moment-to-moment, hour-to-hour, and day-to-day. All of my abilities to plan and to prioritize went out the window. Something changed in my brain—the part of my brain that was the multi-tasking, planning part shifted. I could not do these things with the same efficiency. When I went back to work—I had to for health insurance and financial reasons—I found the details and management to be just too much. Whereas these had once been strengths of mine they no longer were. Perhaps I am being hard on myself because we did manage somehow. Tara: You used a financial planner you found around the time your husband entered hospice. How did this person help you in the days leading up to your husband’s death and shortly thereafter? Nancy: I found a financial planner through a social worker associated with a program I had been put in touch with after Brett’s cancer diagnosis. I found managing money scary. Since Brett was in business and finance that was something he had always done. In the therapy I was receiving during Brett’s illness, it became clear that money was a huge source of anxiety and worry to me, and for this reason, I was connected with a financial planner. She and I worked with Brett to have him hand over the financial reins. It was clear that his cognitive function was declining. But it was difficult. We did this gently and together. By the time Brett died, I felt I would not be alone in this way. Tara: In your personal opinion, what is the first thing a Solo Mom should do to protect her finances following a partner’s death? Nancy: Pay attention to things like wills and life insurance. If you have a will, make sure that it is current. Buy life insurance when you are young and healthy. Try to imagine every logistical challenge and situation and plan as much as possible. Consider ways to have an emergency fund. Many women have to return to work for reasons of finance. This can be so overwhelming. I remember feeling panicked by things like a lack of life insurance. Plan ahead as much as you can. Tara: You took a grief trip after Brett died, and you’ve described the “widow’s curse” as being abruptly seen by others for what you had become: a widow. You write about the awkwardness of being perceived by strangers—how you felt that they could see the sadness and the brokenness in you. I relate to this because after the death of my son I had trouble trusting that I was reading people correctly when I saw them. I know I made people uncomfortable. Did this trip give you time and space to grieve? Is this something women could do to support the newly bereaved—take up a collection to send mom on a grief trip? Nancy: I am not sure the grief trip was the best option. I was really overwhelmed. I felt I couldn’t do anything. I couldn’t parent. I couldn’t take care of anything. The trip was lonely. I think now that I like the idea of a retreat better. Something like what is organized by Soaring Spirits. My own trip was a short respite, but it was lonely. And it was not restorative. The larger question you ask has to do with how I internalized being a widow. There was this sense of otherness about me, how you are on the inside. Nothing rids you of how you perceive yourself in the world. It took time. I realized I was always identifying myself first as a widow, “I’m Nancy Sharp and I’m widowed.” It was holding me back. It was not so much outside of me as it was inside of me. I had to stop identifying myself first and foremost as a widow. I had to learn to reframe my narrative. Tara: You write movingly of how your life changed in New York City after your husband died. What specifically made you pick up and move across the country? You had a dear friend, I know. But still. This felt very bold to me. What was your first thought when you moved to Denver? When you got off the plane? Nancy: I wanted to go to the mountains. I considered the Catskills, even Italy [laughs]. There is something so sturdy and permanent about the mountains. And I think that there is something so good for people in grief to be able to cast their eyes outward, to gaze beyond. I came from New York City to Denver, in part because I had a dear friend. When Brett was alive, we had visited the city and liked it very much. After he died, I knew we had to leave New York City. Denver is many things, and among them, it is more affordable than other places, especially coming from New York City. Everyone has a different vibe and pace. I knew I needed to slow it down. While some have wondered at how we picked up and moved and even said it was brave, I remember thinking: What’s the worst that can happen? Tara: How did you meet your second husband? Nancy: When I moved to Denver, so many people were trying to set me up. One morning I was reading The Rocky Mountain News, a local paper (now defunct), and it was referencing the area’s most eligible singles. Stephen Saunders, a local anchor/journalist, was billed as a hot catch. I was a Solo Mom to five-year old twins, and I did not have time to watch television. But that night I watched television, and thought Steve was very attractive. So I just e-mailed him. I did not hear back. For two weeks I did not hear back, and so I re-sent the e-mail, wondering if it was possible that it landed in a spam folder. Why not try again? This time, he answered right away. Steve was a widower and had two sons. We quickly began a relationship. We had a lot in common beyond our losses. You cannot build a relationship on loss because it can’t be sustained. We married and blended our families in 2008. Tara: When my son died, my older son was so young that I struggled with how to permit and promote memory of our baby. Since then, my oldest is growing up and other kids have since been born. It is both a weight and a curious blessing to try to be someone’s memory. How do your children, who were little when their father died, remember him as they grow up? Nancy: My twins, Casey and Rebecca, have no memories of Brett. Rebecca still sleeps with her memory quilt stitched from pieces of Brett’s clothing. Mourning has evolved a lot for both of them. At times, Brett has felt like an apparition looming too big, almost. It can be a little scary. I keep his memory alive by telling stories. Sometimes silly stories like how much he loved cheese steaks. Brett’s best friend George assembled a collection of letters to the kids from different people in Brett’s life about who he was. These letters are collected but the twins have not read them yet. You take your cues from them. Memory is one of those things that is elusive yet tangible. It evokes feelings about a person, but it can also be stirred by touching a wallet or a watch, for example. To me memory is like love—it’s always there. Tara: I have found that my children have taught me to grieve better. I want to model for them the idea that it healthy to be present in joy and in sorrow at the same time. This is full tilt authentic living. What have your children taught you about grieving? Nancy: Kids teach us to grieve by being incredibly patient. Kids carry grief in a different way. Because Brett made these children, they carry his loss all the time. Once I was driving in Connecticut, and we passed a graveyard. I mentioned this and Rebecca asked about Brett. Casey told her Brett was in the sky. “Where is the sky?” Rebecca pressed him. Casey said, “The sky is everywhere.” I thought this was beautiful. They teach me to be really present in their feelings. There is no end of pain for loss. It is always there. But I try to model living for my kids. Brett would have wanted this for them. While they have an ever-present grief in them, they are happy children. They have a wonderful father in Steve. For myself, I know that widows can rewrite their story and not be paralyzed. You can own your own story without being owned by it. Make the past a part of your living present. Do this without letting it become the whole part. It is OK to go forward and to love and live. You will carry your loss forward. But you can’t let it dominate. Let it breathe. Let it sit. But live your life.